Jonathan Blow, the outspoken developer of last year's Braid, doesn't like story-based games. That's not because the stories aren't any good, but because he thinks they're completely missing the point. "Stories in games are typically not good, right?" Blow asked in an interview with Gamasutra. Not many people are going to argue that - the reason we're seeing more and more high-profile authors writing games is because nobody thinks game stories are any good. For Blow, however, "even if we had really, really good writers doing this stuff - it's still really hard to do a good story in a game, because of the game part." 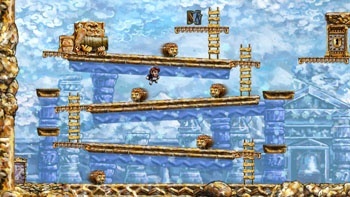 Blow sees games as essentially challenge-based, a notion that certainly rang true for Braid, which was essentially a sequence of increasingly challenging time-manipulation puzzles. The problem, then, with story-based games is that stories conflict with those challenges. "So the challenge part is trying to hold the player back and keep him from getting to the next segment," Blow explained. "But the story part wants you to get to the next part in order to keep going. This structure doesn't actually work, because these two fight each other." The common solution, as Blow explains it, is for a designer to create the sensation of challenge instead of "real challenge" so that it doesn't get too much in the way of the thrust of the story. Citing examples like God of War and Fable II, Blow believes that the softening of challenge just makes the gameplay flaccid and meaningless. "Fable II's combat is not actual challenge," he said. "It's just there to feel like combat. But I don't feel like there's a reason to do it, because I know that I just hit these guys with the sword a few times and they'll just die." Ultimately, the point isn't to tell good stories, because that's not what games are built to do and that's not what makes them superior to other mediums. "In terms of what games have to offer us, we're not giving people the greatest stories ever told," Blow said. "What we can give them is experiences that challenge them to invite them to do something that they haven't done or whatever...If we eventually become no interaction and all story, then we're just a bad movie, right?" I'm inclined to agree with Blow in that story and challenge often don't mix, and both are left worse for it when a game tries to put them together clumsily. But while I love (and sometimes prefer) a game that's pure challenge, I do think there is genuine narrative power in games, and that maybe we haven't started looking at how to tell stories in games the right way. What do you guys think?